Did you ever stayed late at work in the office during a stormy night? Then you’ll probably relate to One Late Night, a short and free horror game where you play as a graphic designer employee who stays to finish some work. Nothing out of the ordinary… until some inexplicable and spooky things start to happen. Far from the current horror trend of Slender and its uncountable clones, One Late Night goes a step further and provides a true adventure experience that will keep you enthralled until you discover the end of this horrifying story. 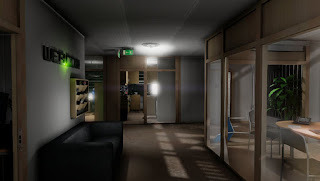 Although this is a game that resorts to some jumpscares, they blend perfectly into the amazing atmosphere, one that truly conveys the feeling of being alone at night in an office complex. This is also one of the few free horror games that looks truly amazing and not just assembled from a set of standard blocks and textures – you’ll have a great time examining every detail on your desk, opening every cabinet, reading the packages and, ultimately, being scared by the things (we won’t spoil it) that are keeping you company. There is such an impressive level of interaction with the scenery that you’ll easily forget about the rigidity of a Slender, a Resolute Dark or even a Baby Blues, all good games by themselves. This may be a linear game, but it’s one game with a story to tell, a terrifying one at that. You’ll shiver when you discover new details, when you find out that your missing co-worker Robert was actually doing more than office work and you’ll hide under the desks – there’s an option for that – every time you sense something near you. One Late Night won’t leave you indifferent. This is an amazing game from Black Curtain Studio and it’s free, so you have to play it. You won’t see another game like this for a while.